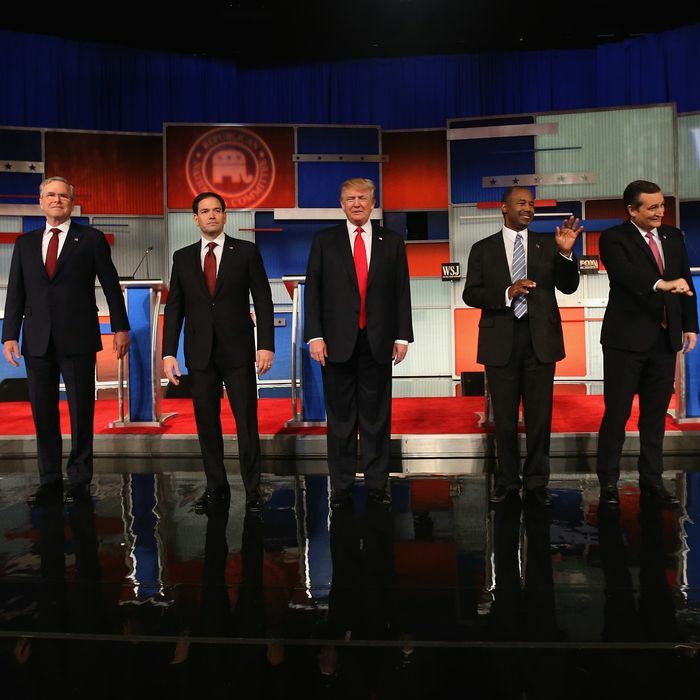 All signs point to a two-hour slugfest of a debate. The big variable in all but one of the prior GOP candidate debates has really been the moderators and the format they utilize. There was the first debate on Fox News when Megyn Kelly famously tried to take down Donald Trump, only to illustrate Trump’s strange ability to gain power from negative attention. And there was the CNBC debate, when the candidates staged a revolt against hostile questioning and battened on conservative fury toward even relatively friendly media. Yes, the last debate, on November 10, sponsored by Fox Business News and The Wall Street Journal, was an exception; the candidates were more or less allowed to regurgitate their standard talking points, and friction among them was largely self-generated. But tonight’s CNN debate in Las Vegas is being openly advertised as a brawl, probably much like the Reagan Library CNN debate two months ago, in which moderators (especially Jake Tapper) framed nearly every question by quoting an attack on one candidate by another. Given a format that guaranteed rebuttal time to any candidate mentioned in an answer, the setup guaranteed a combative atmosphere. You can expect a lot more of that tonight. Want a taste of what sort of debate this will be? Just watch the promo CNN has been running for the last month, which features a rapid-fire screenshot of each candidate paired with pulsing background music. Sources briefed on the network’s plans say it’s looking for a two-hour slugfest full of confrontation — the kind of program CNN boss Jeff Zucker loves. Several campaign aides told POLITICO they expect CNN to begin the debate by pitting individual candidates against Trump – perhaps by asking if they condemn his controversial proposal to ban Muslims from entering the United States. The tactic would be designed to hook viewers from the get-go. As for the focus of the debate, the network is tipping its hand: It will be about national security. Over the weekend, CNN aired a promo that showed images of violence in Paris and San Bernardino before cutting to the Republican candidates. “Who will keep America safe?” the voiceover asks. Aides say they’re prepping their candidates for a battery of questions about the Syrian refugee crisis, National Security Agency wiretapping, and Islamic State terrorism. As for the impact of the format and questions on individual candidates, the only sure thing is that it’s the sort of WWE environment in which Donald Trump has thrived in the past. You can expect Chris Christie and Marco Rubio to take shots at both Trump and Ted Cruz for their relative unwillingness to send U.S. ground troops into Iraq and Syria; I wouldn’t be surprised to see Christie emerge as the star of the show, given its trappings. The other highly predictable feature will be Jeb Bush’s latest effort to give a lift to his floundering but expensive campaign. It’s become fascinating, in a slightly sadistic way, to watch this man struggle against his manifest limitations. Once the debate has mercifully ended, we will get the usual insta-analysis of winners and losers via snap polls, focus groups, mad campaign spinning, punditocracy, and Twitter. If there is a severe and telling blow suffered by a particular candidate (with Bush and perhaps the insufficiently martial Rand Paul being the most likely candidates for a crash), it will be exaggerated into catastrophe. So stock up on Red Bull and your favorite brand of jerky and enjoy the show.